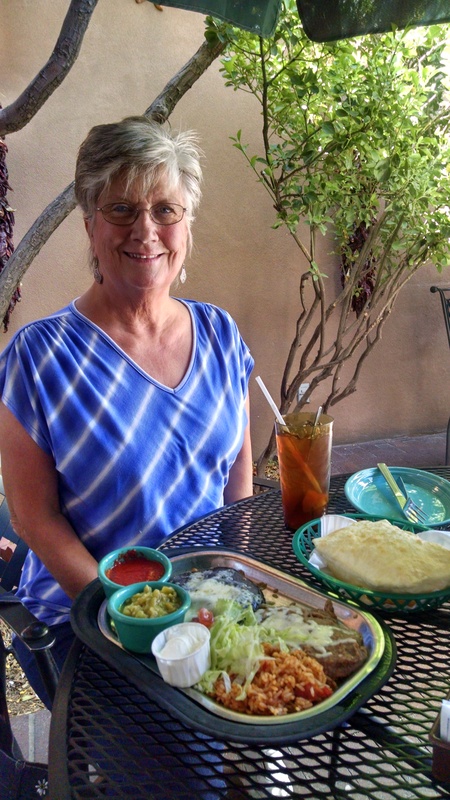 After leaving Santa Rosa, New Mexico we drove to Cochiti Lake about 23 miles from Santa Fe. We had the option of a large site with a lovely view for two nights or a not so nice view site for three nights. We chose the lovely view. We enjoyed daytime watching the birds and the smoke from the fire in the hills and then after dark, we watched the stars twinkle ever so bright. This was our first campsite since going full-time in the wild (so to speak, with electric). Fire in the hills at Cochiti Lake area. Thought to be started by lightening and under control. Cochiti Lake Campground. Our backyard for a couple of days! On the first day we headed to Tent Rock, National Monument close by. This is a relative new National Monument of 2001. The Tent Rocks are on private land, but one can hike on Federal Land for a close up view of the tent rocks in the canyon. We did not do the hike but drove the scenic drive and found it something that we had never seen before, nor had we heard of it. The second day was our Santa Fe outing. We drove through The Plaza, but decided not to park and walk. The streets are narrow and our truck a bit too large for the street parking or for the low clearances in the high rise parking, and the street pay parking lots appeared full. It was very crowded. The vendors were busy with many patrons this day. However, the goods appeared wonderful, colorful and full of interest for me. Alas, I have no need for more stuff since we have down-sized to the RV. We drove on for the highlight of my day, the Santa Fe Train Depot. 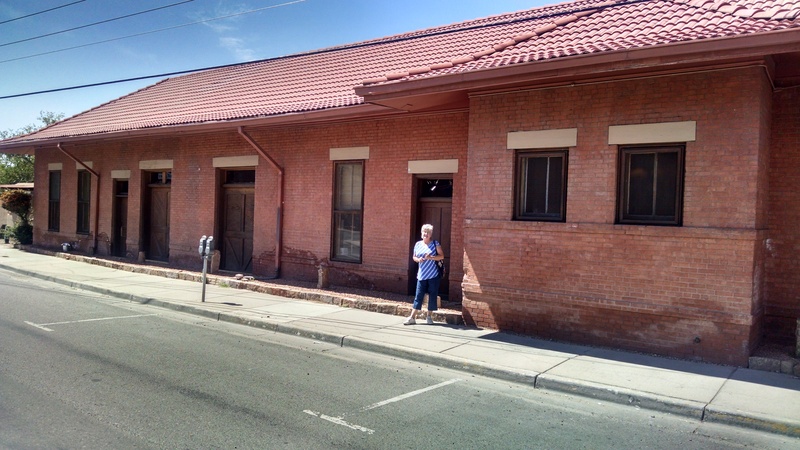 I have wonderful memories of the Santa Fe Train Depot. My daddy worked for the Missouri Pacific Railroad when I was a little girl and we could travel on railway passes. 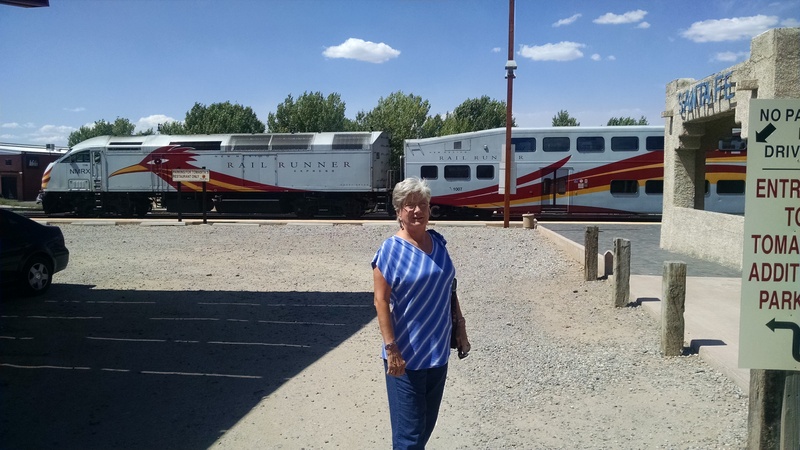 Mother loved to travel, and we would travel to see my sister in California and an aunt in Colorado, all via the Santa Fe Stop over. The station was the prettiest depot that I had ever seen. There would be Indians in native dress, vending various beaded items and jewelry outside (not as elaborate as the Plaza, but fun to browse). Mother purchased a small leather purse for me and gave me a dollar and fifty cents to put in it, since I was too young for lipstick or anything else that a girl might put in a purse. Of course I forgot it, leaving it in the station and did not notice it until we were boarded and under way on our trip. I was in deep trouble with my mother. On the advice of the train conductor, I wrote a letter to the station manager asking that if it was turned in, would he please use the $1.50 to mail it to me. A few days later, it arrived with the dollar fifty still in my little purse. I quickly learned to appreciate honest, good folk, to keep track of my possessions and to write thank you notes. 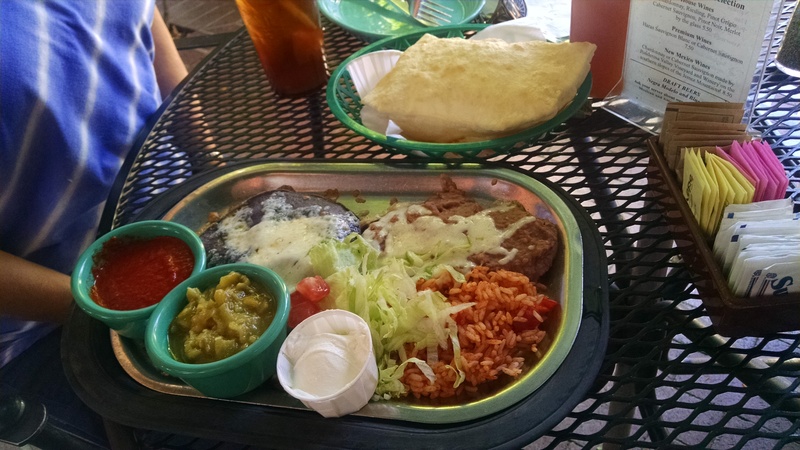 We roamed the area and had lunch at the train depot which is now a fancy restaurant called Tomasita’s, I was just giddy with happy memories of my travels with mother on the trains and my memory of the nice station manager on the site where we were having lunch. I must have been gushing with excitement as a young couple at the next table ordered additional drink glasses , shared their margarita pitcher with us and allowed me to share my story of the “lost little purse” raising a glass to my sweet past memories of Santa Fe. My brother is driving thru SantaFe in MH so I shared your post with them. Hope you don’t mind. Thanks Linda! I too, remember Union Station in St Louis. It was a bustling place where Santa Fe was quieter and usually warmer. Share anytime, that is why we are blogging our travels.